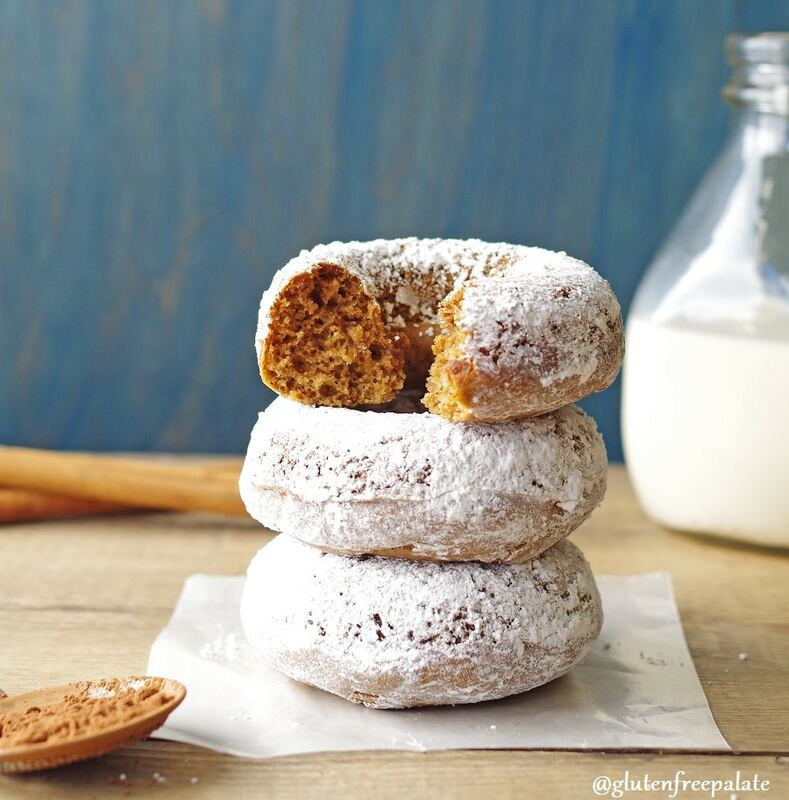 Did someone say Gluten-Free Gingerbread Donuts? Tender, fluffy donuts with hints of ginger, cinnamon, and cloves – the ultimate gingerbread treat. The holiday season is in full swing. And for me, that means I am baking up a storm in the kitchen. 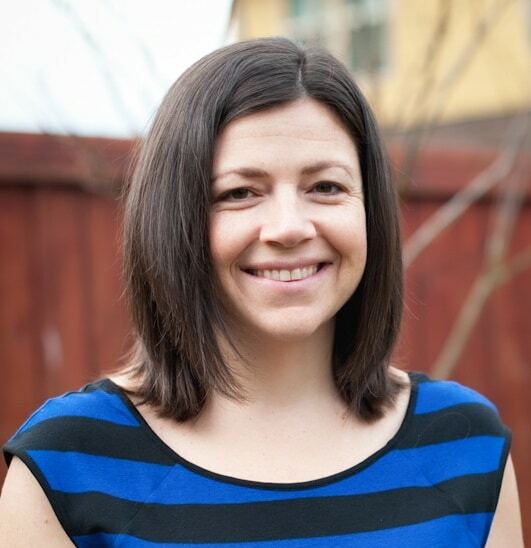 Not only am I creating recipes for you, I am baking for my kids classroom parties, pot lucks, and holiday parties. Our friends and family expect us to bring something fantastic to each gathering. Something new. Something that will get them excited for the next party. Every year I whisk and mix away in the kitchen trying to find that one recipe. The recipe that will please them all and meet everyone’s dietary needs. That’s where these Gluten-Free Gingerbread donuts come in. 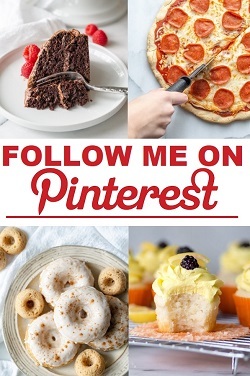 The good news for for everyone, is that most of my recipes are posted here on gluten-free palate, and many are shared with my neighbors (which doesn’t help you any, but they sure love it). 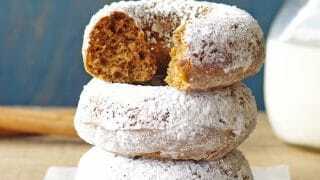 These gluten-free Gingerbread Donuts are sure to be a keeper. They are light and airy, and they crumble in all the right places. The subtle hints of ginger, followed shortly by cinnamon and cloves leaves something to be desired… a cup of coffee or a glass of milk. They are coated in a cocoa-powdered sugar mixture, bringing some of my favorite flavors together. Just a warning in advance, they are quit addicting. After you polish off the first one, you may find yourself inadvertently reaching for a second. 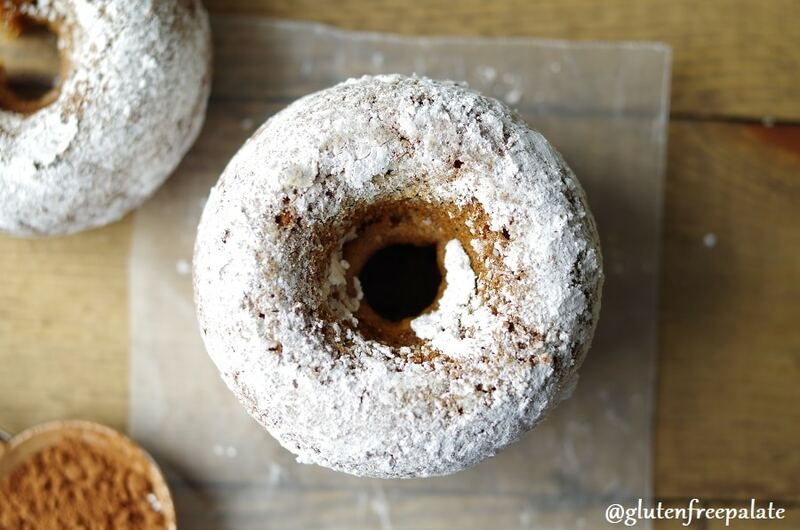 It’s best to share these delightful Gluten-Free Gingerbread Donuts. If you like donuts (and who doesn’t?) you might also like my Vanilla Birthday Cake Donuts, or my Gingerbread Donuts. 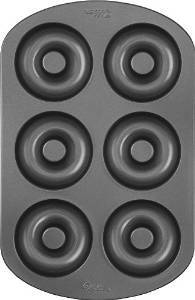 I use this affordable Wilton Donut Pan(affiliate link) when I make donuts. In fact, I have two for recipes that make 12 donuts. 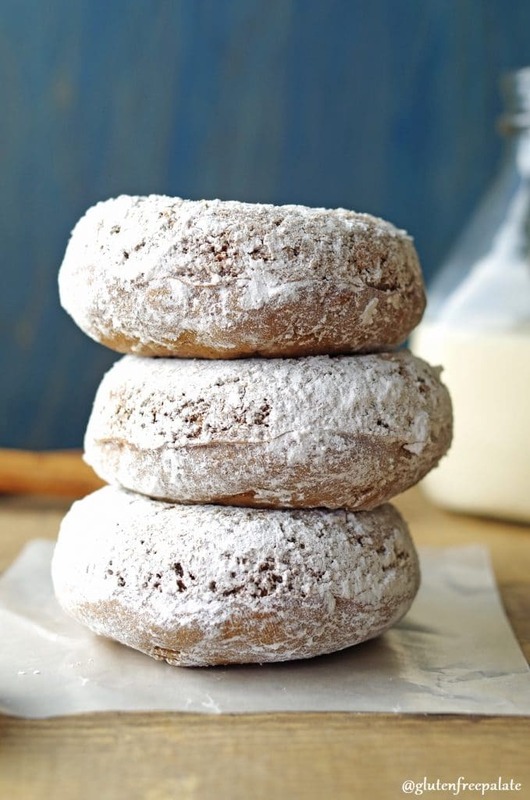 If you are looking for other donut recipes simple search for “donuts” in the search bar at the top left of the page. 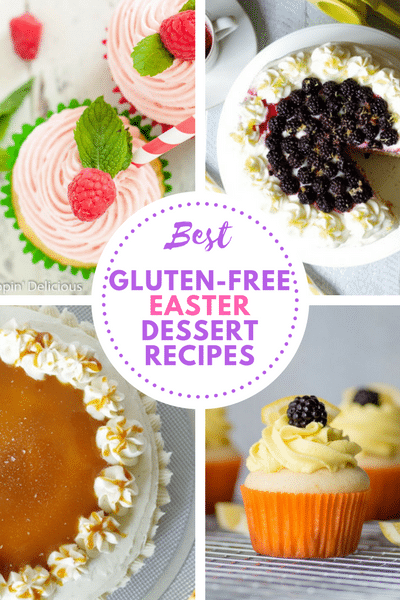 I’ve got lots of great donut recipes including Gluten-Free Chocolate Cake Donuts and Gluten-Free Vanilla Birthday Cake Donuts. 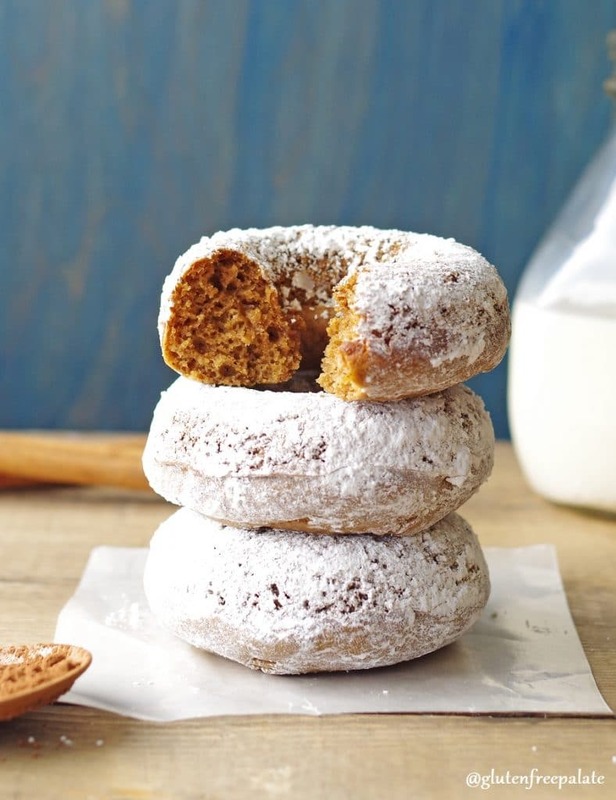 Did someone say Gluten-Free Gingerbread Donuts? Tender, fluffy donuts with hints of ginger, cinnamon, and nutmeg - the ultimate gingerbread treat. Preheat oven to 350°F. Grease a six-serving donut pan; set aside. In a separate large mixing bowl combine egg, molasses, melted dairy-free butter, brown sugar, and dairy-free milk. Bake for 10-12 minutes or until the donuts rise and set. Carefully remove the donut from the pan to a wire rack set over a cookie sheet or piece of parchment paper. In a separate small mixing bowl, combine the powered sugar, cocoa, and cinnamon. One at a time, dip donuts into the cocoa sugar mixture and roll or spoon the mixture over the donut until it's evenly coated. Place your donut on the rack and repeat until all donuts are coated. If desired, coat a second time. Gingerbread Doughnuts??? These look and sound absolutely amazing! My whole family loved them! I hope you do as well. The description states hints of nutmeg, yet I don’t see it as an ingredient. Could you clarify? Thanks for the catch. The description should have said “cloves”. I just love making doughnuts! Love that you powdered them too! Your Ginger Bread Donuts look delicious. Pinned and added to my must make list. Thanks for sharing the gingerbread love Laureen! I love gingerbread flavors at this time of year! i love gingerbread everything! I haven’t tried a gingerbread donut yet so i have to soon! these look amazing! Oh yum! I’m definitely going to be giving these a try. I love gingerbread anything. 🙂 Thanks so much for sharing these at Savoring Saturdays, Chrystal. I’m going to be featuring them at this weekend’s party. Thanks Raia! I am thinking about making them for breakfast on Thanksgiving for the whole family. It will be a yummy way to start the day. Sharing these on Savoring Saturdays this weekend, because how could I not? Thanks for linking up! Thank you! I love Savoring Saturdays! Hello Sammi! I’m so glad you enjoyed them 🙂 Thank you for letting me know. I was just browsing through your recipes and then I saw gingerbread and then I saw it was followed by doughnuts and I was hooked!! Made these for a snack today for my 3 kids. They devoured them and asked for more. I really enjoyed them too! Thanks! So glad they like them! The donuts look delicious! Can you substitute any nut milk for the flaxseed milk? I love making these for my best friend and I. How can I make them more moist? We make a batch of whipped cream for our frosting! These donuts shouldn’t be dry. If you aren’t spooning your flour into the measuring cup, try that. If you are already spooning the flour into the measuring cup, try leaving 1 tablespoon out. Wow, so fun to hear from a reader in Sydney! Thank you for stopping by. I’m glad you enjoy my recipes. For donuts, yes, if it makes 6 you can double or triple the batch. I’d start with doubling – and maybe even write out the recipe with the ingredients double (and double check them) so you don’t accidentally add the regular amount. These look fabulous. When I looked at the nutritional information, I wonder if you plotted the whole recipe, and then forgot to divide by 6 for the number of servings, as the info looks much higher than I would expect. Yes! I switched the plugin that displays the recipes and it defaulted back to the total number of calories, etc. vs just for one donut. I am working through fixing them all. I’ll get this one updated. Thank you!